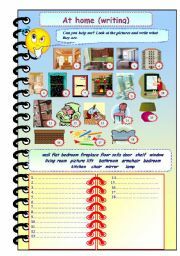 I´m an Engish teacher from Russia and I enjoy my job.I like to teach children and to make different activities for them and ESLprintables is one of my favourite sites. 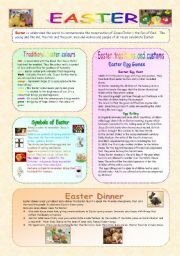 Easter comes soon.Let your students read and speak about this holiday.1.Reading activity about traditional Easter colours,Easter egg games,symbols of Easter,Easter dinner.2.Easter crossword+speaking activity(answer questions about Easter)3.Key to the crossword.I hope you´ll like it! 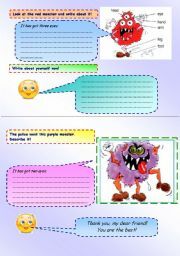 A worksheet for younger children.They are to look at the pictures and write the names of them.Beautiful and colourful! Your ss are to write about the monsters in the pictires and they will train "has got" and "parts of the body".It´s interesting to describe monsters! 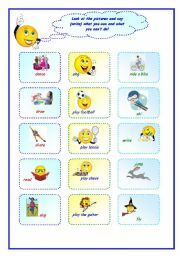 This worksheet to teach children action verbs and modal verb can.I think you´ll like it as it is easy to work with it in the class.Children can speak and write as well.Good luck! 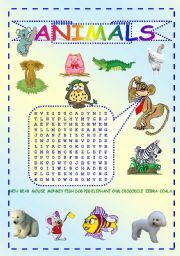 It´s a beautiful wordsearch "Animals" with pictures.My children like to look for animals and they know them quite perfectly.Enjoy it! A small test for beginners. 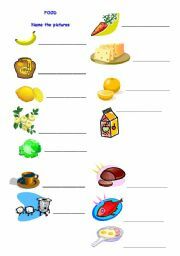 This flash-card is recommended for children from 6 to 9.They must show their knowledge of vocabulary. 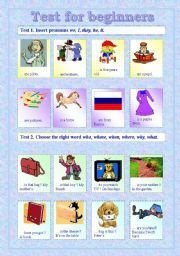 The slides turn over like a book and it´s rather interesting for children.Children see a picture of a new word and how it is written.After learning these words your children read riddles and guess what it is.Good luck! a presentation about ecological problemson our Earth.You can read and discuss it in the classroom. It´s a ppt game on the topic "Animals".It contains 14 slides but because of the size it is divided into four parts.There are hyperlynks in the presentation so be attentive.You may use your own design,because of the size I didn´t use it. It´s a ppt game on the topic "Animals".It contains 14 slides but because of the size it is divided into four parts.There are hyperlynks in the presentation so be attentive.